Our English Library is growing steadily; we now have almost 60 members. We also have a bank account and even better a cheque book and some money in the account. Janie, who owns the chateau in which the Library lives, has also started up Social Evenings, where we meet up and play cards, board games and generally have a natter – and we do have some French coming! We went to the Voutezac Peach Festival again in July. As usual the actual Festival was a bit tame, but the evening meal was a hoot. Lots of singing and dancing, and the obligatory excellent firework display afterwards. As I have decided not to do the elevated photography any more we decided to get a new(ish) car. After many hours on the internet I realized two things. The French don’t have as many second hand cars for sale – at least in the Correze. Probably due to their not having such a culture of company cars as in UK. And the ones that are for sale are pretty expensive. Eventually I found what I wanted in Bordeaux – about 2 hours’ drive away. 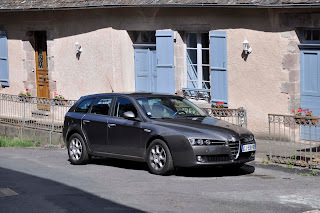 It’s an Alfa Romeo 159 Sportswagon 1.9 JTD – big enough for the dogs and much more enjoyable to drive than the Discovery. All we have to do now is sell the Disco. Buying the car was quite interesting in itself. I approached my bank and they said they were quite happy to lend me some money. Great. Please put it in my account and I can go hunting. Mais non! Tell us the exact car you are proposing to buy, and we will then, possibly, give you the money. We drove to Bordeaux and test drove the Alfa, and were very happy with it. The garage price included new tyres, paintwork touching up, a new CT (MOT test) and a year’s guarantee. Also to be paid was the tax needed to be paid to reregister the car and the new number plates – again sorted by the garage. I was told that the car would be ready in a couple of weeks, and on the appointed day I travelled to Bordeaux by train. A taxi to the garage got me there to be told it would be ready the next day. As I subtly hinted that this was not really satisfactory they sorted everything out and I was able to drive home in state. Coming from metropolitan Bordeaux (pop about 1 million), the staff were slightly sniffy about us rural types. One of the staff remarked that I came from the Limousin. The other salesperson paused, looked thoughtful and finally pronounced “Ah, le Limousin…..tres calme!”. Not sure it was an accolade. My brother Martin and his family came to visit when they came on holiday to the Dordogne. They stayed one night and we also drove down to see them at their holiday village – luckily it was the day after I took delivery of the Alfa with its air conditioning – the temperature hit 40 at one point. We have a lot of duplicate books in the library, so I took some into the library in Uzerche, a very attractive town near us. They have a reputation for being very supportive of culture and cultural events, and I am hoping we may get some support from them for moving our library there – as it is a bit more central and easy to get to. As I have probably said before, the normal market here is actually a farmers’ market. 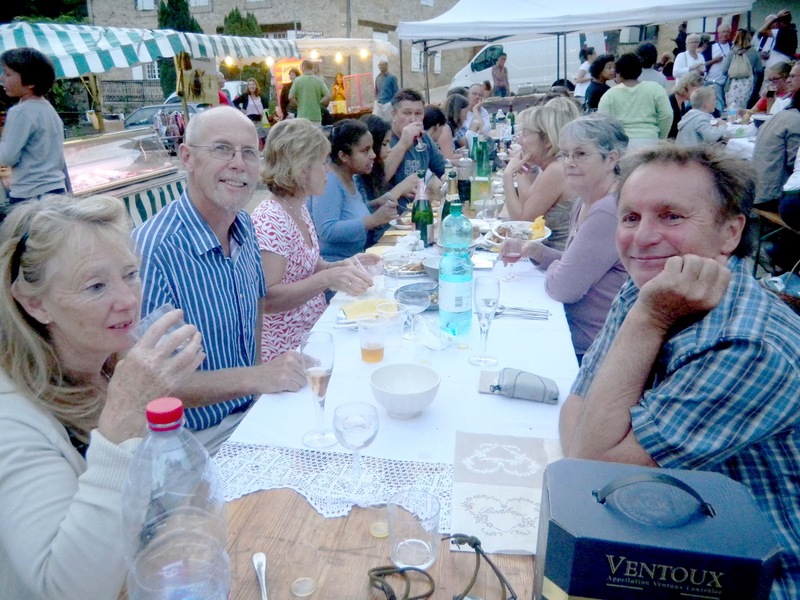 Many villages also hold evening markets in the summer, where there are stalls selling fresh or cooked food, and a lot of tables for you to sit at. Some even provide barbecues so that you can choose your steak and cook it to your liking. We managed to find one of these when I took my brother and his family to Segur le Chateau – a really beautiful peaceful village. The dozens of cars parked everywhere gave us a clue that it might not be so peaceful – we had hit an evening market. Bang went the quiet drink! 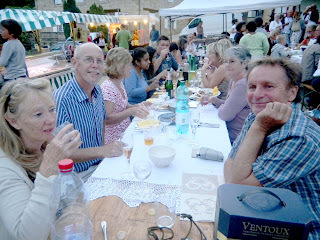 We went to another evening market in the Dordogne, where a friend had her birthday party. It was a really nice evening, as we made some new friends as well as having some good food. On a further trip to the Dordogne I drew a floorplan for a manoir belonging to an estate agent I have done some work for. It is a lovely place which she rents out as a holiday home and drawing up the plan was very enjoyable. If you want a really nice place to rent see http://www.homelidays.com/salignac-eyvigues/maison-villa435582fr1.htm. 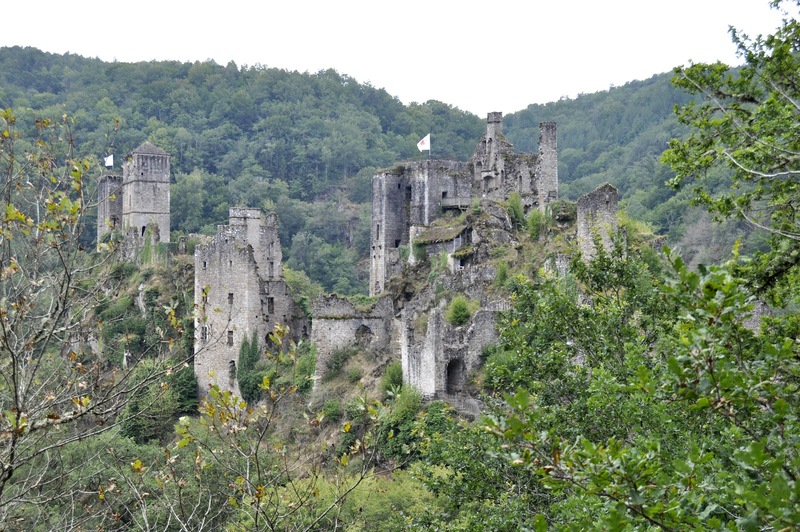 Another really good day out was a drive to the Tours de Merle about 90 minutes south east of us. There a number of towers which, oddly, were all built next to each other by different noble families. Very impressive as it sits in its quiet valley. 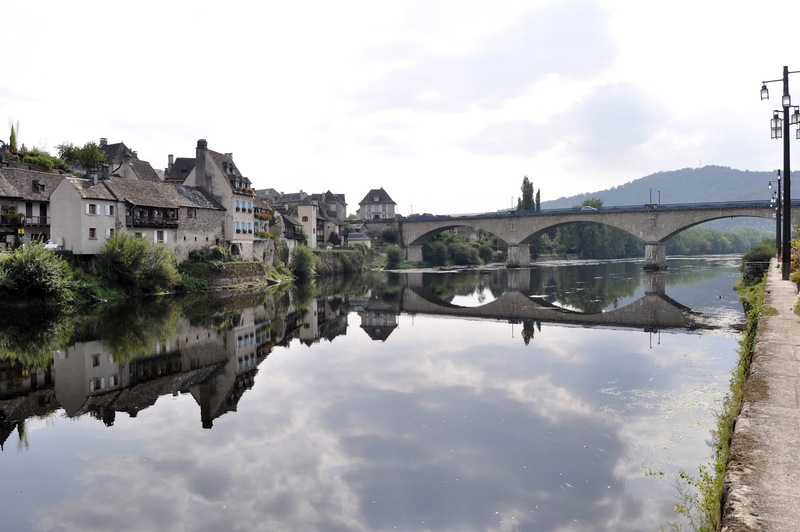 On the way back we stopped in Argentat, a beautiful town on the river Dordogne. We had the trauma of a heating oil delivery a few weeks ago - €1200 to fill up. I think this is one of those times we tend to look back at what we paid in UK over 3 years ago, and gas prices have rocketed since then. But it doesn’t make paying all in one go any more pleasant! We have advertised the Discovery – only one viewing so far – fingers crossed. I popped over to the UK for a school reunion – it was a mere 50 years since everyone started in the first year of the Royal Grammar School in Guildford. The school is now private – it was in its very brief phase of being a state school when we went there. In it’s over 500 year history that was a very short period! It was very nice to meet up with old friends again, and I also got see our children and grandchildren. The only slight glitch was the kindly soul who ripped the wing mirror off my hire car. The organiser of the writers’ club I belong to planned a writers’ weekend at our friend’s chateau. It was a great success, with some very interesting speakers – especially on self-publishing and a lady who has been a top journalist for 30 years. I had a slight health scare last week. Our doctor ensures that we have a blood test every year. The laboratory spotted a slight rise in my level of the Leucocytes, which are something to do with the white blood cells produced by bone marrow. The doctor said that there was probably nothing to worry about, but he would pass it onto the Consultant at Brive hospital, who works on the Cancer unit. I had a jolly 4 weeks wondering what the verdict might be, but when we met the doctor, a consultant haematologist, she proved to be a very reassuring (and she spoke excellent English thank goodness). I have Chronic Lymphocytic Leukaemia, which is much better than it sounds. Basically it shouldn’t cause any real problems for at least 10 to 20 years, and there are already treatments available for that phase. In 20 years they will probably be able to cure it. Unfortunately I reassured my children rather too quickly, and before I could get too much sympathy (dream on) they were satisfied that I was OK. Looks like I’ll have to buy that Kindle Fire myself…..